Drake fans have their Namasdrake flow, animal lovers have their own yoga (from goat yoga to vinyasa on horseback), and now Hogwarts super fans can rejoice—because Harry Potter yoga now exists. 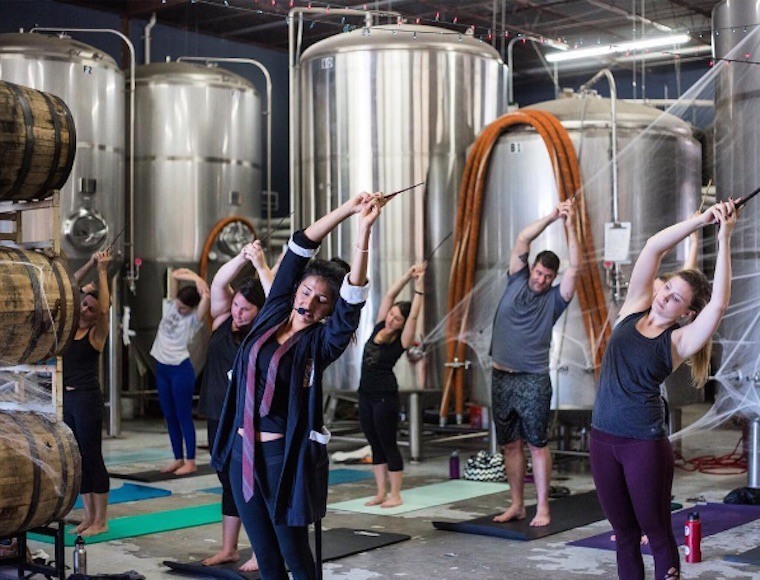 To commemorate the anniversary of Potter’s parents’ death, yogis joined together at a brewery in Austin, TX, (Circle Brewing Co., which offers a Pints & Poses class on the reg) to channel Deathly Hallows and engage in some enchanted yoga, Cosmopolitan reports. Wands in hand (yes—really), the class moved through your typical vinyasa flow but with a Potter spin. Think Slytherin cobra, Whomping Willow (AKA tree pose), and savasana under an “invisibility cloak,” otherwise known as a yoga blanket. Instructor Isabel Beltran motivated the Potter fans by saying things like, “Imagine you’re sitting on the Hogwarts Express,” and called the attendees “Dumbledore’s army.” She also read from Harry Potter and the Deathly Hallows so the yogis could truly feel immersed in the cult-fave series and transport themselves to the fictional world filled with mystical creatures and spells. The class ends with a Potter-inspired beer and a potion station, and photo ops galore (with a “Have you seen this wizard?” Prisoner of Azkaban photo frame, Mandrake garden, and an actual sorting hat made out of papier-mache with cookies to match). Could this be a new (magical) method for escaping everyday stress? If you’re looking for other ways of managing stress, try this all-natural alternative to Xanax or take notes from these yogis on staying calm even in stressful situations.